Thursday August 3rd 1893 As soon as we could get the work done up Fanny and I went over home to help put up two boxes of pears. They were all done by five oclock and I came on home to get supper for them and got supper later for Will when he came. I was very tired at bed time. 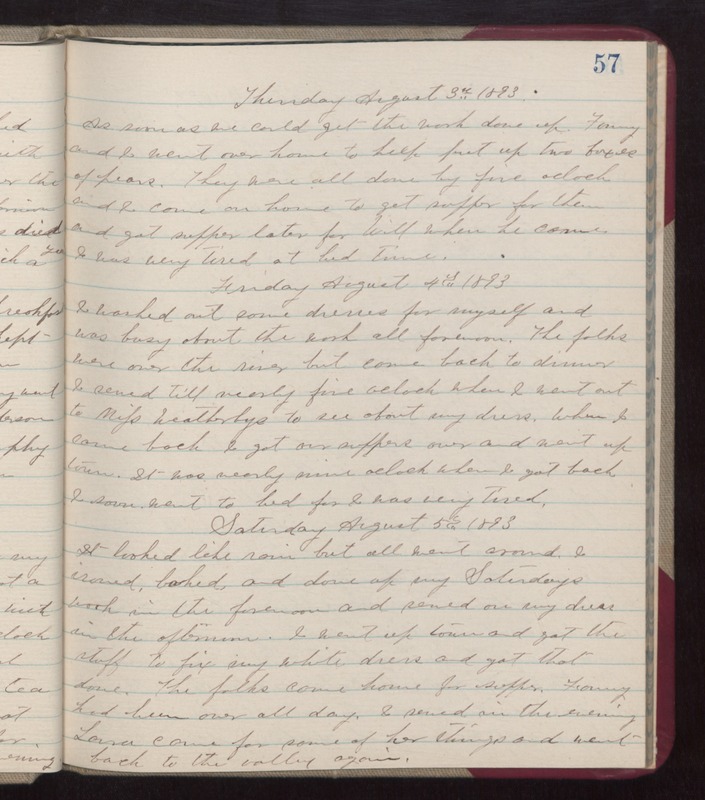 Friday August 4th 1893 I washed out some dresses for myself and was busy about the work all forenoon. The folks were over the river but came back to dinner. I sewed toll nearly five oclock when I went out to Miss Weatherlys to see about my dress. When I came back to get our suppers over and went up town. It was nearly nine oclock when I got back. I soon went to bed for I was very tired. Saturday August 5th 1893 It looked like rain but all went around. I ironed, baked, and done up my Saturdays work in the forenoon and sewed on my dress in the afternoon. I went up town and got the stuff to fix my white dress and got that done. The folks came home for supper. Fanny had been over all day. I sewed in the evening. Laura came for some of her things and went back to the valley again.